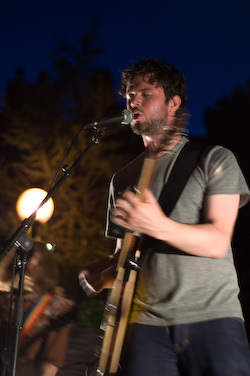 After having immersed myself in theater all week, I took a leap back into the musical world for the penultimate edition of Fringe Pop, which took place at the outdoor stage of Parc des AmÃ©riques. 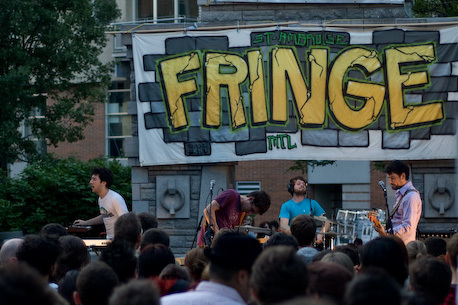 The free music shows are a collaboration between the Montreal Fringe Festival and Pop! Montreal, bringing acts such as The Dâ€™Urbervilles, The Handsome Furs and Wintersleep to the music-thirsty Montrealers. Last nightâ€™s show included the klezmer beats of The Youjsh, the up-and-coming Zeroes, and the ever-so-awesome Juno winners Wintersleep. The Youjsh â€“ Is it just me or is there an increasing number of bands playing klezmer-type music? This seven-piece ensemble is formed by a bunch of young Montreal jazz musicians. A very fun group to have for an early evening outdoor show, they got an extremely warm acclaim from the audience. I really enjoyed this music as well, especially how adept drummer Phil Melanson added original and spicy rhythms to the jazzed up klezmer tradition. Zeroes - The first time I saw this band perform live was during the Pop! festival last fall. Even though I have some good friends in this band, I really didnâ€™t like it so much. It was their first show ever so I donâ€™t know how much can be expected from a band taking their first steps. Since their debut, they have gone from sloppy, spacey and grungy (not in the good way), to a solid, entertaining and truly great musical act. They sound like a variety of other Canadian Indie bands, but they sound great and pull off the deal with flying colors. Their sound resembles a little the one of Holy F%?k. Their songs donâ€™t have many lyrics and tend to drift off into extended instrumental parts. 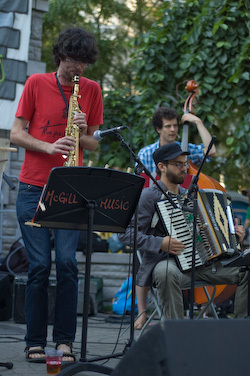 I believe theyâ€™re all former McGill Jazz students so their technique is strong and well developed. The jams really work quite well and theyâ€™re tighter than most instrumental bands of their kind. It doesnâ€™t sound so calculated and stale. In fact, I donâ€™t know whether itâ€™s planned out or not, but it sounds spontaneous with a very dynamic and energetic drive. The way Indie music has been going, I predict this band will get pretty big within the next year. This is a band to keep an eye on for sure. Wintersleep - Iâ€™ve been a fan of this band for a long, long time now. My love affair with their music goes back to when I was still living on the East coast; back when no one had heard of them yet. However, I have never loved them so much as I do now. Since the release of their new record Welcome to the Night Sky (justifiably long-listed for the Polaris) they have become one of my favorite bands. I owe my survival to the insane Montreal winter of 07-08 to this record. Without songs like Oblivion, I think it wouldâ€™ve been impossible for me to push through the wind, cold and snow while I was making my way to work. I wouldâ€™ve surely collapsed in a snow bank and died of cold and discouragement. Theyâ€™ve been touring the world with great success and growing popularity over the past few years but havenâ€™t been to our beautiful city to play so much. It was with great excitement and joy that I finally saw them perform songs from their new record last night at the gorgeous outdoor venue. Though the sound wasnâ€™t great, it was a great show where I enjoyed seeing people from all ages come together at this special event. I even convinced some of my jazz friends to stick around for this, which is a decision they didnâ€™t regret. They loved the band even though before the show, we were discussing the elusiveness of discovering an Indie band in a live setting and actually loving it. Fellow MP writer Paloma, also present at the event, wishes to add that "for once, a band has become successful because of their perception and insight -- almost tangible in their songs and in between them. Hearing them in the homey Fringey atmosphere was a tasty treat to mark the first day of summer. On behalf of Midnight Poutine, I proclaim Wintersleep the Prochaine Grande Chose. And they aren't even from Montreal. I pledged to actually purchase their CD." It was a great concert and even every act brought something awesome to the table. You can still check out the final edition of this special event at the Parc des AmÃ©riques tonight.